She wanted a sapphire instead of a diamond. I like it. After seven years together, I proposed to the love of my life on October 15th, 2017. The best part? She said yes! Another couple helped me set up the plan for a photographer to be present. We've now selected a date, booked the venue, chosen a professional photographer, and she has started searching for the dress. The venue's Wedding Checklist List is extensive, but we are on track for our November wedding. Now on to why you are reading about all this. After I proposed, she asked me for my wish list so she could get me an engagement present. I obliged. At the top of my list was the Smith & Wesson 929, a Schofield in .45 Colt, a Colt Competition in .45 ACP, and a Charging Rhino in 9mm. 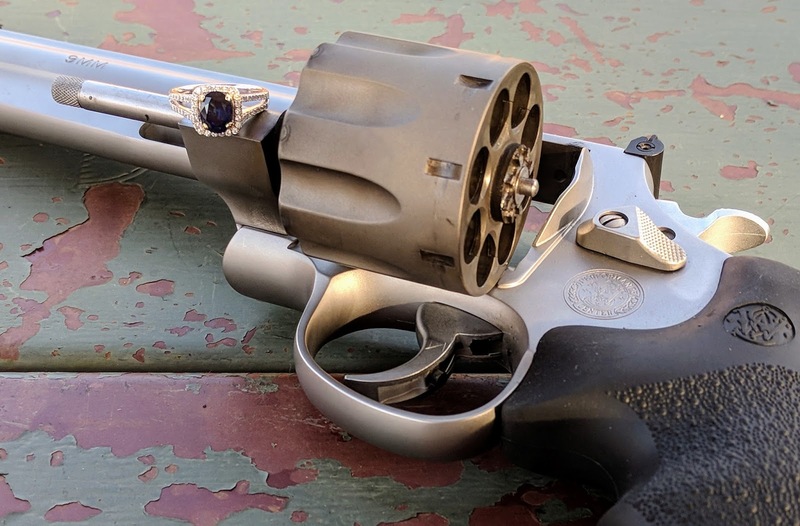 Even though she preferred the 1911, she knew I wanted a 929 for USPSA and purchased one new for a song. As a bonus, she received the rebate from Smith & Wesson. I've now taken it to the range a handful of times, so I wanted to share my first impressions. This thing is big. 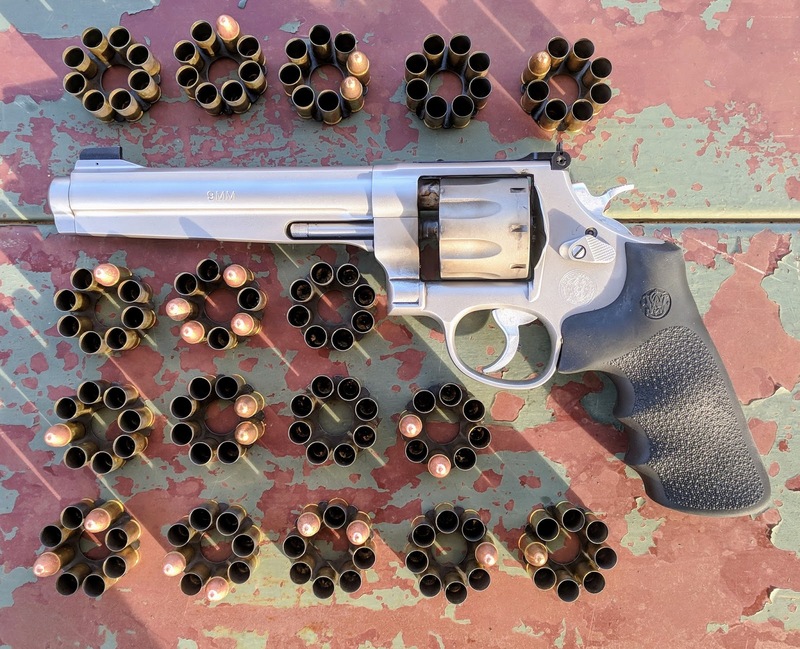 This is not my first 6 inch revolver, but this wheel gun feels heavier. It isn't any heavier than my S&W 617. In fact, Smith & Wesson's website has both revolvers listed at 44.1 ounces. Strange. The only changes I made was to swap the comp to the muzzle cover and exchanged the N-frame Hogue stocks to the X-frame Hogue stocks. These were in my parts bin after my time with the S&W 325 Thunder Ranch. I didn't adjust any screws or mess with any springs. I did a bit of dry fire and the trigger felt better than other factory S&W revolvers I'd dry fired in stores. I ordered two ten packs of moon clips from Brownells, which was a nightmare because they shipped me 627 moons twice, and loaded them up for the range. This revolver performed well on the first trip, fine on the second, and poorly on the most recent trip. I've rated the trips because I steadily encountered more and more light strikes. I am surprised because this was a brand new gun. I figured that the tension would have been set by the technician at Smith & Wesson. That is a lot of light strikes. Of the 136 shots attempted on my most recent range trip, the 929 had 22 light strikes. This was disconcerting to say the least. Once I returned home, I removed the Hogue stocks and examined the strain screw. It looked nowhere near flush with the frame. I was able to turn the screw three full rotations before it bottomed out. I guess the tech who assembled the 929 felt those last turns were unnecessary. It is also possible that the previous 200 rounds backed the screw out enough to cause failures. My other issue was an afternoon spent chasing a zero. I started at 10 yards and shoot a 1.5 inch group shooting in double action. I'll take it. I walked down to the 25 yard board and hung a larger grid style target to fine tune the zero. Aside from the light strike issues, I could not reliably get on paper. I would shoot a four round group and only two would be on paper. So I hung a new target and began shooting groups in single action, finding similar results. I even pulled out the S&W sight adjustment instructions to ensure I wasn't adjusting incorrectly. I gave up to try another day. It must have been me. Despite these issues, I am still excited to have a new revolver for USPSA and maybe even ICORE! I ordered more moon clips, an APEX extended firing pin, an APEX Evolution IV hammer, and a BMT Mooner Model N9-8. I put all of this, plus 8 loaded moon clips, into a box and brought it to the local revolver guru Steve. He said it would be a few weeks to get it all tuned up. I asked for a smoother trigger pull with a 7.5 to 8 pound double action pull to reliably ignite the factory Federal 9mm ammunition that I will be shooting. I'm currently hunting for a 6.5" left handed N-Frame holster with a little bit of a race style cant. Comp-Tac's International might work, but I'm very fond on Master-Tac Holsters. I'll give Bill a call and see what he can do for me. I think I've also decided on the Speed Beez's 929 Moon Clip Belt Rack with 8 posts as my ammunition carrier. I'm hoping my folks will pitch in on that for my 29th birthday next month. If all goes well, the February USPSA match will be shot with my new S&W 929. Congrats on the engagement and congrats on the new addition!